The Haultain Valley 14 meter Ocean Standstill. At the end of the ice age the land, in relation to the sea level, was undergoing enormous changes around Greater Victoria. Where the land surface was covered by ice or had ice sheets nearby, it was pushed down making local sea level high in relation to the land. This was occurring even when world-wide sea levels were much lower. As ice melted the local earth’s crust quickly rebounded and relative sea level fell at least 45 meters below where it is today. The sea then slowly came back up to near its present level around 4500 years ago – creating Victoria harbour, Esquimalt harbour and the large Bays as we know them today. It is of scientific interest to determine when and what part of the landscape was available at this time for the occupation of plants and animals – including humans. During the period of rapid local emergence of the land from the sea there were short periods of stability. At these short times of more stable environments ancient beaches with clam beds developed in the bays and inlets found at various levels over time. These periods of stability are called ocean standstills. At these now buried locations one can often pull out whole intact marine clam shells. 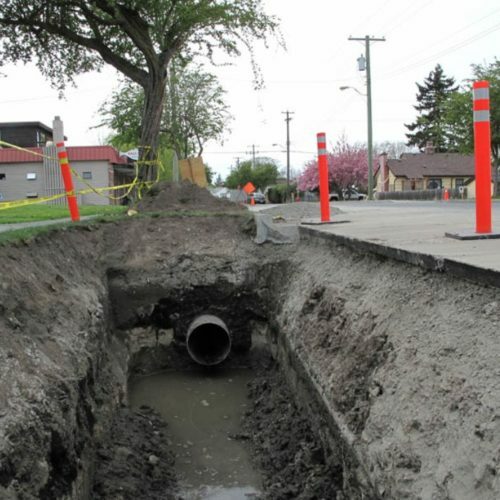 These locations are usually exposed during digging for the installation or replacing of sewer or water mains and by modern housing developments. 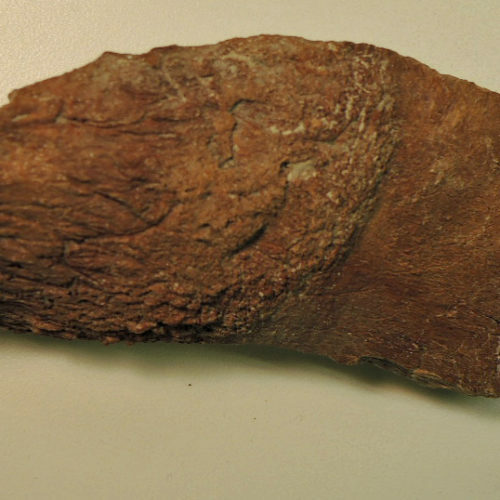 There is evidence of humans spearing mastodon and butchering bison around 13,800 years ago to the south of Vancouver Island on the Olympic peninsula (Waters et. al.2011) and Orcas island (Kenady et al. 2010). We should expect to find similar evidence on southern Vancouver Island. 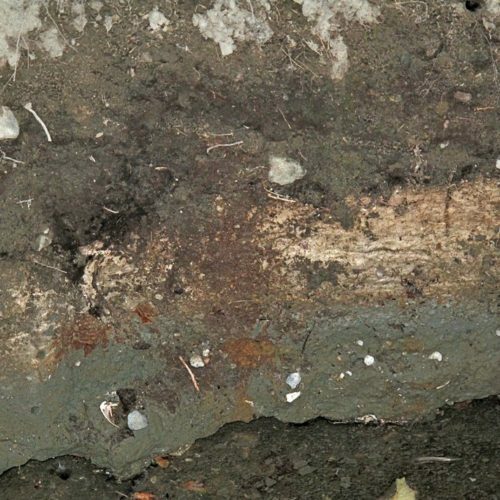 Much of the evidence for the history of Indigenous people in Greater Victoria is missing between about 13,000 and 4,500 years ago because the sea level was far below what it is today. The bays we are familiar with were not here. There was no Victoria or Esquimalt Harbour, they were dry land. Evidence of indigenous activity is still to be found at inland localities, but these are much more difficult to identify than the large shell middens found at the back of most current bays and inlets. Any coastal villages occupied during that time are now under water and mostly destroyed. There will, however, still be some interesting intact waterlogged evidence in silted in bays. Most stone artifacts washed out of old, now underwater, village locations and stone tools or weapons lost from canoes will still be found on the ocean floor. A few examples of the ancient raised beaches or sea stands exist around greater Victoria. These are locations where there are buried marine beaches in now extinct inlets or bays that existed for short time intervals in the past. If these bays were stable for even a few hundred years, there may be evidence of human use or habitation at these bays that we need to be looking for. Figure 1, shows an example of an undated marine shell layer at 34 meters above the current sea level. 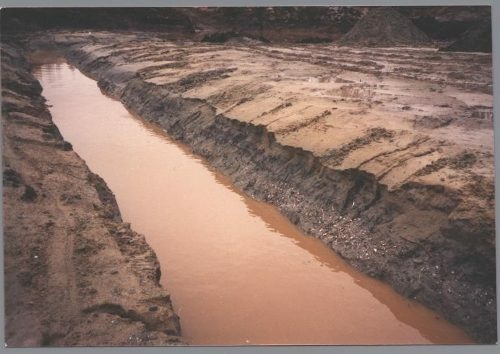 This old marine beach was exposed during excavations in the 4500 block of Lockside Drive on March 12, 1989. Jim Phillips, who lived nearby on Lockside Drive, took this photograph and collected Shell samples at the location. He turned these over to the author in 1993. Areas along Lockside Drive were once an ancient sea ridge. Figure 1. Ancient Marine Beach on Lockside Drive at 34 meters above the current Sea Level. Photograph by Jim Phillips. Figure 2. Marine and fresh water shells from the 4500 Block of Lockside Drive in Saanich. Although some ancient beach levels have been dated for the greater Victoria area, the dates do not always fit with the expected lowering of sea level or the dates overlap considerably – making it difficult to provide specific times for each ancient beach level. When ocean inlets disappear their basins are generally filled in with small lakes or marshes. Some radio carbon dates pertain to the testing of peat or marl (composed of fresh water snails) at the base of these wet areas that often lay above the extinct ocean basin. These dates can only tell us when the sea level was no longer at that location. The dates may be several hundred years after the ocean has retreated from the area. It is therefore import to compare the actual shells from each of the beaches as well as later material. Radio carbon dates need to be re-calibrated based on known changes in atmospheric carbon found at various times in the past. Scientists refer to this as the re-calibrated date. Although the atmospheric carbon re-calibration has been refined over the years, a second calibration is needed when dating marine shells. This second calibration is needed because of the different amounts of carbon in different marine environments at different time periods. 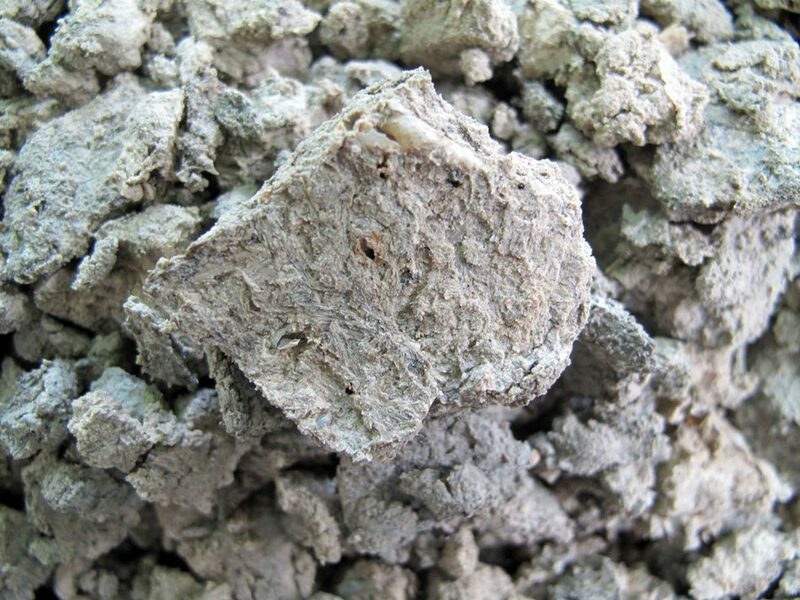 Marine shells can produce older dates than contemporaneous terrestrial non-marine materials. This is because marine shells can contain older carbon. To re-calculate a standard radio-carbon date on marine shells for the Victoria area, at least minus 400 years would be added to the calculation of dates more than 800 years old (Deo et al.(2004). This is called the marine reservoir correction number. It is believed that the need for a decreasing reservoir correction number during the early Holocene is due to lower amounts of oceanic mixing of carbon when sea level fell. In recent years there have been different calculations on what marine reservoir number should be added to dates of different ages. Hutchinson and associates favoured adding 950+or-50 years to dates over 10,000 years ago (Hutchinson et al. 2004). James and associates summarized most of the previous radio carbon dates related to sea level change in the Victoria region using the above calibration figures (James et al.2009). Although they did suggest that the reservoir number was possibly too large for the Victoria area and a reduction to 850 years “would reduce the slight discrepancy between some of the transitional samples and the inferred sea-level pattern” (See Robinson and Thompson 1981; Mackie et al. 2011 and other reference sited for many of the previous publications relevant to this discussion). In light of more recent information by Miskelly (2012)pertaining to the existence of a previously unrecognized glacial advance at around 21,000 years ago of what is now called the Saanich Glaciation, and new information on the early period of the glacial advance and retreat, there is a need for a re-examination of earlier documentation. Clague had demonstrated that the Quadra Sands (proglacial outwash and beach sands) began being deposited in the Victoria area after 22,600+-300 years ago (Clague 1976, 1977). Miskelly (2012)showed that this glacier had reached Saanich Inlet by around 21,000 years ago, which correlates well with Anderson’s demonstration of the underwater glacial terminus deposits in the eastern Strait of Juan de Fuca at the same time (Anderson 1968). Our knowledge of what happened between the time of the retreat of the Saanich glacier and the advance of the Fraser glaciation is in need of much more research. In addition, the possibility that some of the ancient beach standstills may be the result of a short re-inundation of the landscape needs to be considered. I am presenting here a new radiocarbon date, the first date on an ancient marine beach located at 14 meters above the current shore line. The actual location above sea is about 12.8 to 13.8 meters, but I am using 14 meters for discussion purposes. As there seems to be some problem with dates in the region being out of alignment with their stratigraphic position on the landscape, I will present this date from the Haultain Basin of Victoria with two different marine reservoir calibrations to demonstrate the problems involved. More dates of ancient shorelines will be needed to better clarify what reservoir correction numbers need to be used in future calculation of marine samples from various time periods. 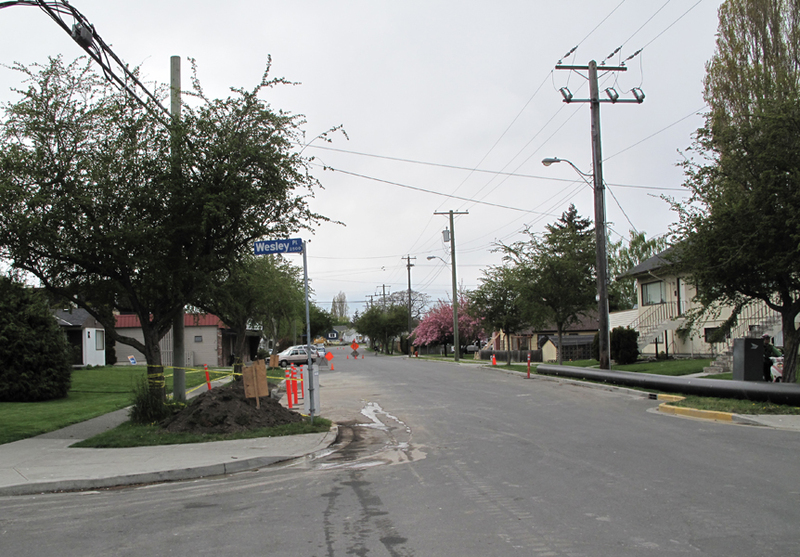 Over the years I have made sporadic visits to examine various excavation holes being dug throughout greater Victoria. My recognition of the importance of this area resulted from finds of marine shells and bison remains by Charles Newcombe in the 1914-15 period under Haultain Street to the west of Empire Street and a later donation of bison remains found a few blocks away on Oregon Street during a water main excavation in 1946. 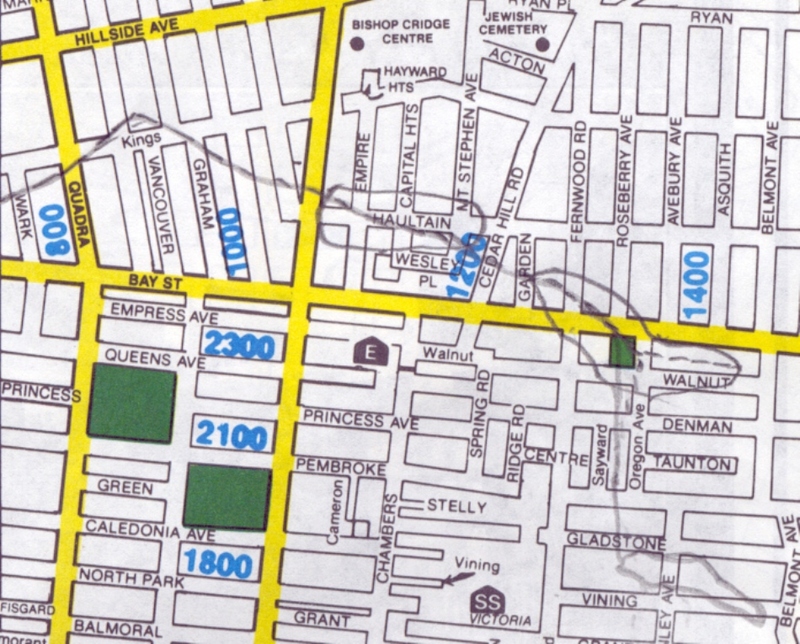 Figure 3 shows Haultain Street, where two blocks down the road to the west Charles Newcombe found evidence of shells from a 14 meter marine standstill and bison remains from the bottom of swamp that developed later at this location. On the left of the image is the location of the recent finds discussed here. Figure 3. Looking west down Haultain Street at area of old marine inlet and later swamps along a creek. Grant Keddie Photograph May 4, 2009. Charles Newcombe was the first person to take a keen interest in this subject matter. In 1914, he wrote a publication entitled: Pleistocene Raised Beaches at Victoria, B.C. (Newcombe 1914). Newcombe had found marine shells and a bison cranial and horn core fragment (RBCM EH.2002.004.0001) in 1914, and a posterior portion of a bison 12th or 13th rib (EH.2007.004.0007) near the same location in 1915 (figure 4A and 4B). Figure 4A. 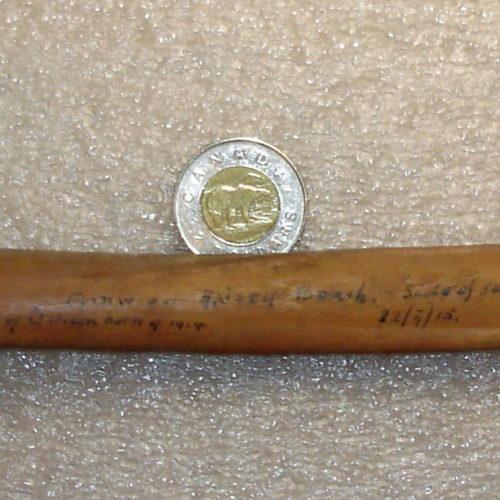 Bison Rib found buried in old swamp above marine deposits on Haultain Street in 1915(RBCM EH.2007.004.0007). Figure 4B. Bison cranium and horn corn fragment found buried in old swamp above marine deposits on Haultain Street in 1914(RBCM EH.2002.005.0001). 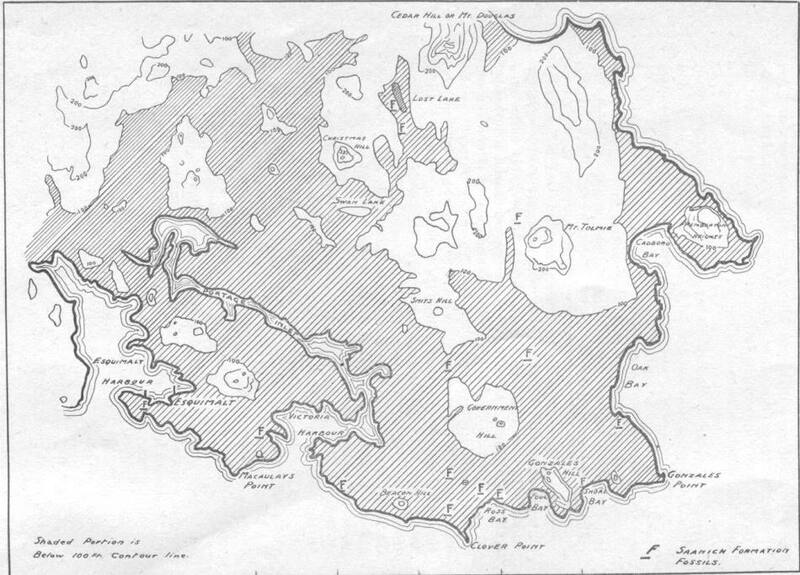 Newcombe’s 1914 map, not as accurate as those of today, shows what he calls the Saanich formation marking the area up to 100 feet (30.48 meters). It was below this level where he had observed marine shells in several locations. The highest location that Newcombe did observe sea shells was at 27 meters above current sea level at Blenkinsop Lake (see figure 5). 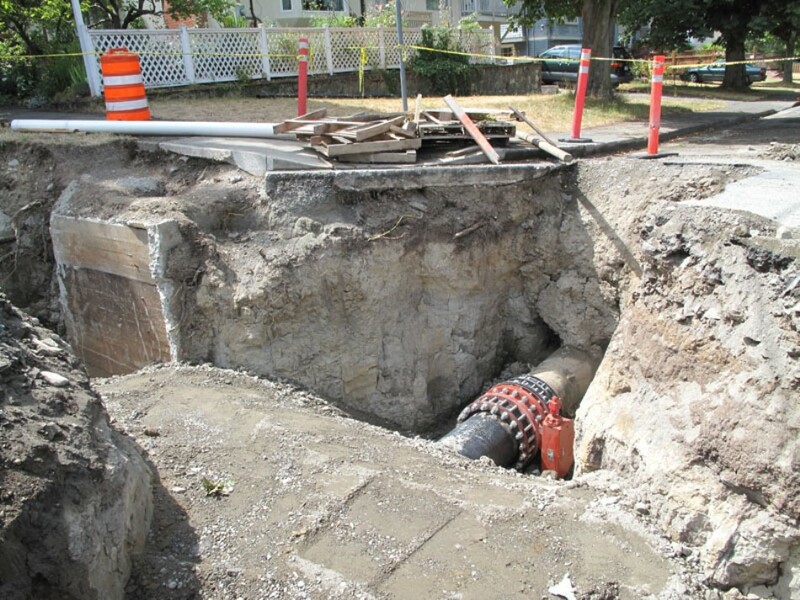 In July of 1946, Herbert Raines, a City of Victoria pipefitter found a nearly complete bison maxilla with articulated premaxilla (EH.2007.004.0001) when sewer pipes were laid along Oregon Avenue further up the Haultain Basin between Walnut and Bay Street (see figure 6). Figure 6. Bison maxillae from above marine deposits under Oregon Street (EH.2007.004.0001).Grant Keddie photograph. 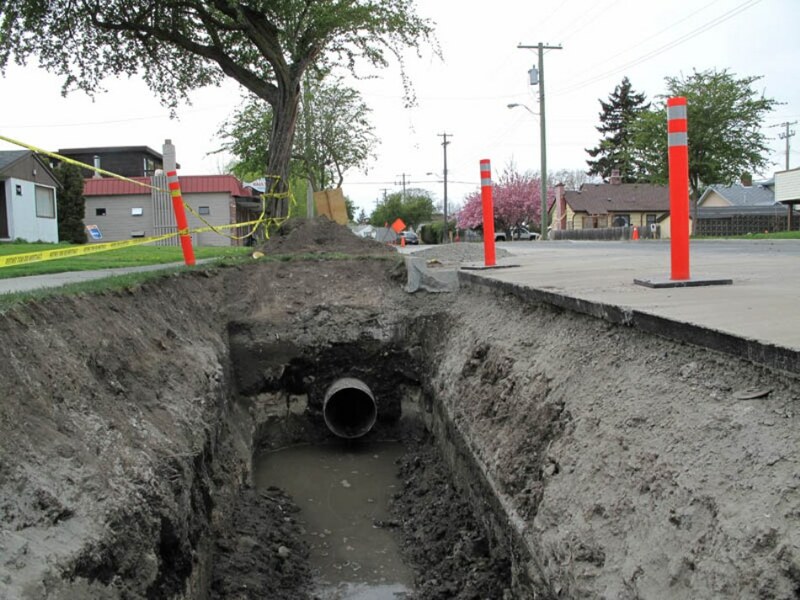 In 2009, I monitored the city of Victoria water main insert project in the Haultain Valley and surrounding areas. 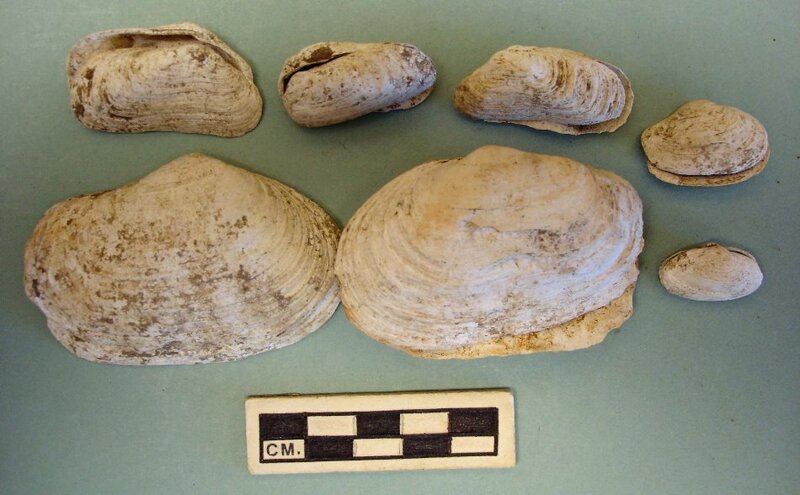 One evening, while looking in an excavation hole on Haultain Street near Wesley Place (48.4361595 N. latitude – 123.3498 longitude) I discovered an ancient beach where whole clams could be pulled out of the cut bank. The location was clearly a 14 meter high sea stand and one that was not dated. Above this marine beach layer is a layer of lacustrine marl from decomposed fresh water snails and above this a peat layer (see figures 7 and 8). I had earlier talked to the project foreman and a number of workers, gave them my card, and told them what I was looking for in terms of stratigraphy and bison remains, and asked them to call me if they find anything. Several days later I received a phone call from Tina Anderson, who worked at the adjacent Haultain Fish and Chips shop where some of the workers came for lunch. She indicated that a larger amount of shells were turning up. Tina has been enthusiastically supportive of helping information recovery and encouraged the workers from the contractor to bring her any bones they might find. 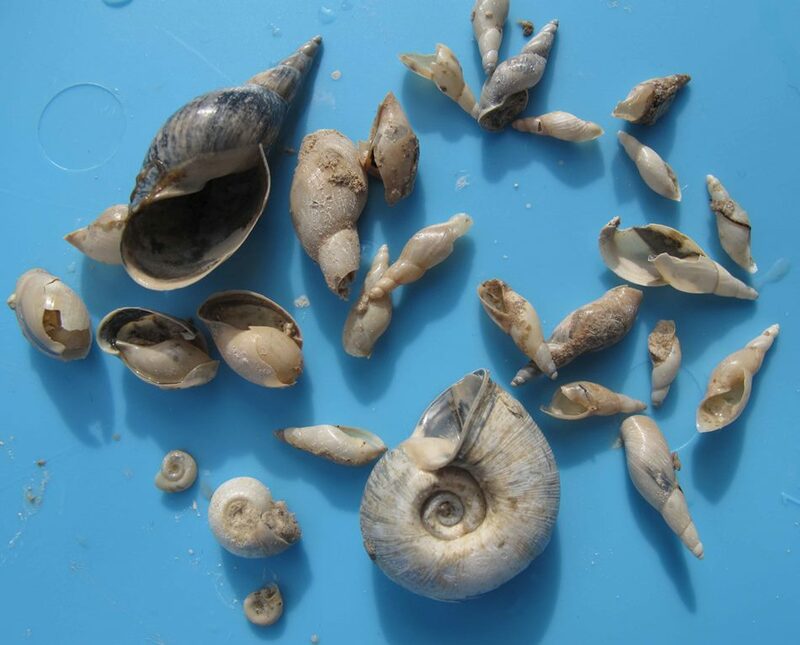 On April 29, I collected Marine shells (Saxidomus & Mya species) from the excavation area. These included specimens that I collected myself from the back dirt piles and insitu in the wall as well as some of those turned over by workers to Tina Anderson (see figure 9 and 10). Figure 9. 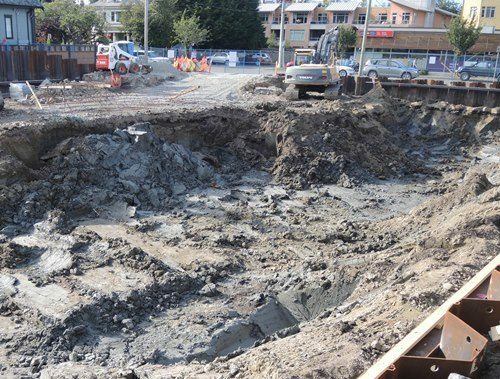 Close-up of Haultain Street excavation. White marl layer of crushed freshwater snails overlays the marine clam shell beach above the water line. Grant Keddie photograph April 28, 2009. I later photographed and collected matrix samples from both the peat layer for future seed and pollen analysis and the marl layer below. 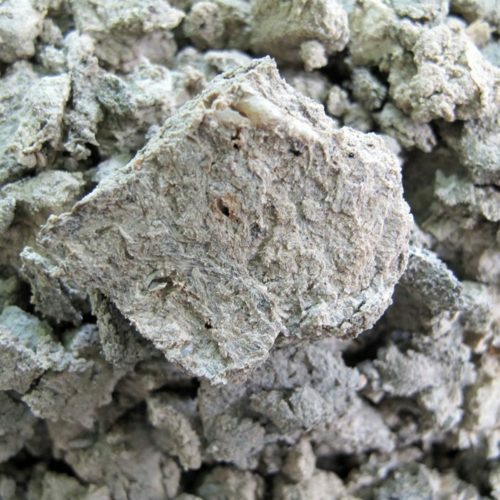 Most of the marl layer is composed of delicate and highly crushed snail shells (figure 11). I collected a larger sample of the marl to go through and extract any complete or nearly complete identifiable fresh water snails (figure 12). Figure 11. Marl deposit. Full of mostly crushed fresh water snails, from the bottom of an ancient swamp. Grant Keddie photograph August 9, 2009. Figure 12. Fresh Water snails extracted from the Marl at the bottom of the ancient swamp. Grant Keddie Photograph August 9, 2009. At another location at the intersection of Walnut Street and Oregon Avenue I had also photographed (figure 13-14) the stratigraphy showing the same sequence of peat overlaying a marl layer that was overlying marine deposits with marine shells. 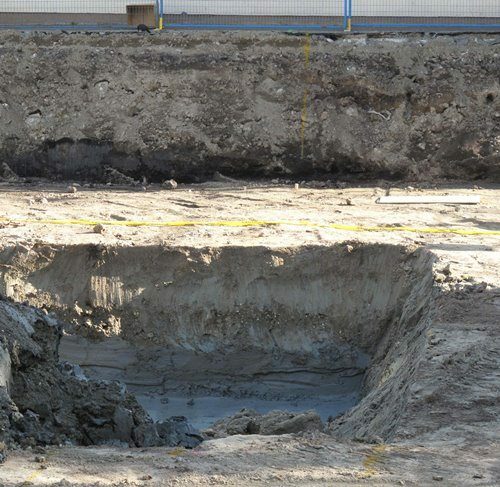 The Haultain Street and Oregon Street excavation locations were both, respectively, within 100 meters of where separate bison remains were previously recovered. 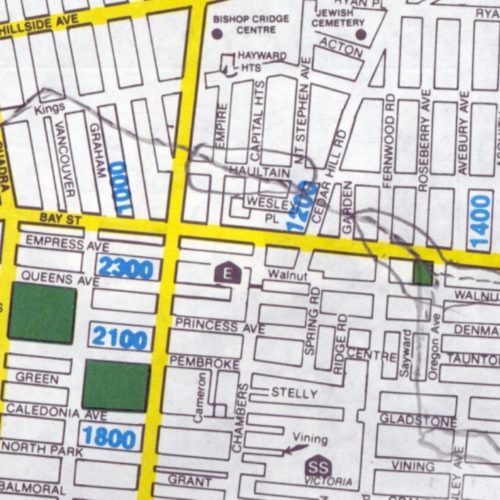 I was able to observe that the marine shell and fresh water shell sequences did not extend east up Haultain Street to Garden Street (c.150cm deep hole) and did not extend east up Walnut Street to Belmont Avenue (figure 15). The excavation extended to a depth of 250cm at the latter location. This helped determine the boundaries of the ancient shore line and that its limit was at 14 meters above sea level – as found on Haultain Street. 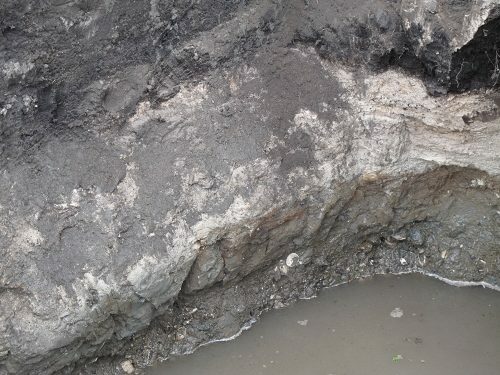 The marl layer at both locations was around 137cm below the present surface. A re-excavation of the same hole on Haultain Street, that I had earlier visited, had exposed new stratigraphy at the east end of the excavations. On August 7, 2009 a worker turned in a tooth to Tina Anderson who immediately phoned me. 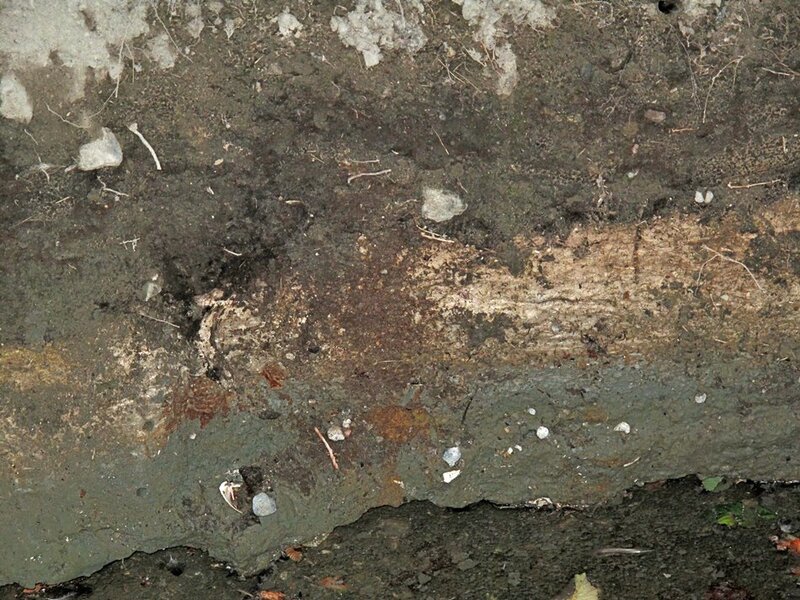 The unwashed tooth clearly showed peat embedded on one side and marl embedded on the other side. This showed that the tooth was found at the junction of these two stratigraphic layers that I had observed and sampled previously and was able to re-examine again. 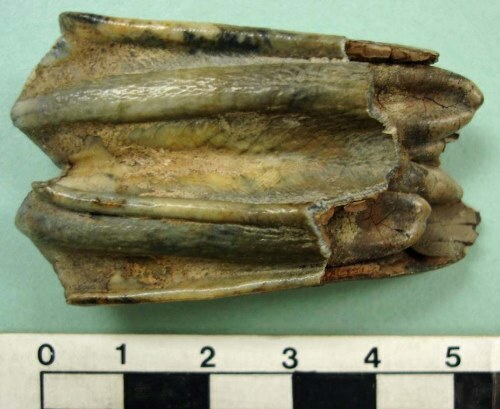 I identified the tooth as the 3rd upper molar of a bison (Figure 16). These remains were from the eastern portions of the same swamp where Charles Newcombe collected bison remains 95 years earlier. The tooth, marine shells and freshwater snails are now part of the Royal B.C. Museum’s Earth Sciences Collection (RBCM.EH2009.016) and await further studies. A portion of a valve of Saxidomus gigantea or butter clam (Accessioned as RBCM.EH2009.016.0020) was sent for radio-carbon dating thanks to the generosity of long time museum volunteer and patron Sharon Smith. The conventional radio carbon age date was 12,910+-40 BP (Beta-488449). Adjusted for the local marine reservoir correction of minus 400+-20 the date is 12,510+-45. The corrected date range to a 95.4% probability is 14,131-13,848 cal BP. or to a 68.2% probability is 14,069-13,920 cal BP. If the marine reservoir correction was minus 950+-50, the calibrated age on a date of 11,960+-40 BP would be 13,886 +- 166 BP or a range of 13,720-14,050 BP. Using either of the marine calibrations the results are not much different for the probable date range of the sample. If we combined the maximum and minimum extent of the two ranges we can provide a probable conservative date for the Haultain 14 meter standstill between 13,720 and 14,131 years before present. Comparison with other Ancient Beach Stands. I will only refer here to three locations with dated marine standstills in close proximity to the Haultain valley that I see as most pertinent in the discussion. The calibrated ages given for the other raised beaches are reported after James et al. (2009). There are difficulties with coordinating radio carbon dating with elevation in this region. As mentioned there has been changing opinion as to how much time needs to be taken off to account for the varying amounts of carbon found in shellfish remains at different time periods. As James et al. suggest “It is possible that the marine reservoir correction of 950+-50 years is too large for the Victoria area”, but they chose to retain the 950+-50 years marine reservoir correction proposed by Hutchinson et a. (2004)for samples older than 10,000 BP. Only a few kilometers to the south of the undated 34 meter ocean standstill on Lockside Drive is a 27 meter ocean standstill located at Blenkinsop Lake. A standard radio-carbon date of 12,110 B.P. (GSC-246a) was received on the shell (Mya truncata) from these deposits (Dyck et. al. 1965). The standard calibrated date for Blenkinsop Lake was 13,060+or-80 years. This result was then given a date range of 13,844-14052 years before present (James et. al 2009). Because the standard correction was not applied to this early Geological Survey of Canada date, a correction factor of plus 400 was added by James et al (2009) giving a date of 13,060-+80. The latter resulting conventional date was adjusted for a local reservoir correction of minus 950+-50 years resulting in a date of 12,110+-94, and from this, a calibrated age range of 13,844-14,052 BP(original sampling Dyck et al 1965). [If the marine correction for 13,060+-80 was only minus 400 the resulting date would be 12,660+-80, giving a calibration range of 14713-15347 BP]. Shells (Hiatella arctica) located at 26m above current sea level received a radiocarbon age of 13,120-+80 (GSC-763) (Lowden and Blade, 1970). Adjusted for the local reservoir correction of 950+-50 it is 12,170-+94 and a calibrated age range of 13,904-14,133 BP (James 2009). If the reservoir correction was calculated at only minus 400 years, the resulting date would be 15,131-+289 BP with a 68% calibration range of 14842 – 15420 BP, and therefore substantially different. 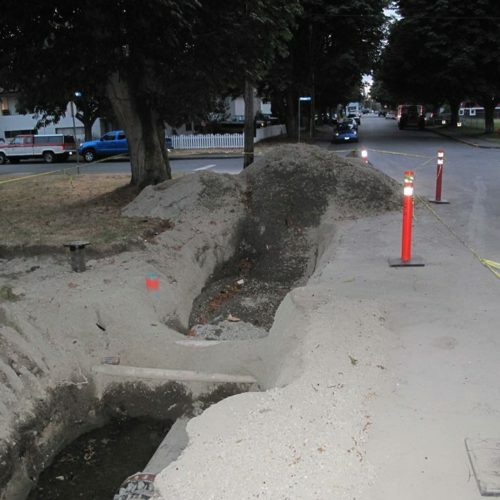 Sea shells were exposed in a day-lighted creek running through the Saanich Municipal yard (See figure 17). At about the same level as the Haultain site, there is a 15 meter marine shell layer at Rithets Bog. However, this shell layer was not dated. A date on a basal Gyttja layer which lay above the marine shell deposits was given a conventional date of 11,400+-95 (GSC-945; Lowden and Blade, 1970). A correction of 625+-60 years to the Gyttja provided a date of 10775+-112 BP and a calibrated date of 12708-12876 BP. (James et al. 2009). This date indicates when the ocean had gone below this level and does not date the ancient beach. A marine shell (Saxidomus giganteus)in deposits c. 1 meter above current sea level was dated to 12,100+-160 (GSC-1114; Fulton 1971). Adjusted for the local reservoir correction of 950+-50 it is 11,550+-94 BP with a Calibrated age of 13440-+ 130 BP and a 68% range of 13,309-13,570 BP. (James 2009). If the marine correction for 12,100+-80 was only minus 400 years the resulting date would be 11,700+-80, giving a calibration range of 13,435-13,731 BP. These marine shell deposits include the Cook Street village area and extended east into Fairfield (See figures 18-19). 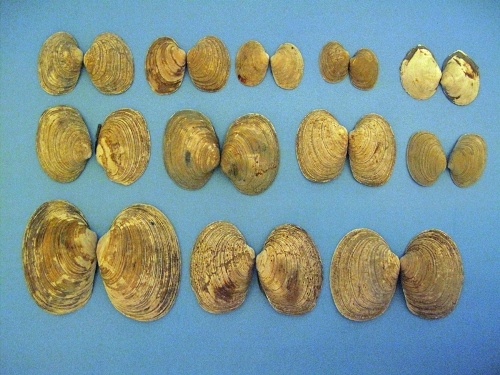 (1) Fresh water shells had a radiocarbon age of 11,200 +_170 (GSC1130;Fulton 1971). A corrected and radiocarbon age is given in Table 1 of James et. al (2009) as 11,620+-85 yr BP with range of 13366-13580 BP. (2) Plant material (peat) was given a conventional date of 11,500+-160 (GSC1131; Fulton 1971). It is recorded as 11500+-80 in Gowen (2005) and as 11500+-85 with a corrected date of 13269-13413 BP in James (2009). (3)Gyttja material provided a date of 11200+-190 BP (GSC1142; Fulton 1971). It is given a radiocarbon and corrected age in James as 11200+-95 and a corrected range of 13020-13193 BP). If we accept the marine reservoir correction of minus 950+-50, the Haultain Street high sea stand was in existence about 13,886 years ago. The possible time range of the ancient beach is between 13,720-14,052 BP. Even if the marine reservoir correction was taken at minus 400, the date range would be similar. The Blenkinsop Lake ocean standstill at 27 meters above current sea level and the McKenzie Street standstill at 26 meters both have similar time ranges using a marine correction of minus 950+-50(13,844-14,052 B.P.) and (13,904-14,133 BP). However, in this case, and unlike the Haultain date, using a marine correction of minus 400(14,713-15,347) and (14,842-15,420 BP) would involve a potentially large difference of 1287 years at the older part of the time range and 869 at the younger end of the range. The expected closeness of dating on these two sites does fit better with the marine reservoir correction of minus 950+-50 years. The calibrated dates before present for the McKenzie Street, Rithet’s Bog and Haultain Basin are in reverse order of what we would expect – the oldest dates being above the younger dates. The Haultain Street date range is 13,720 BP to 14,052 BP with a marine reservoir of minis 950+-50 and a range of 13,848 BP-14,131 BP. When we compare the blended Blenkinsop and McKenzie Street ranges of 13,844-14,133 years ago, they overlap considerably with the Haultain Basin time range. The difference of the date ranges being only 81 years at the older end and 124 years at the younger end of the time range. It is difficult with current dating to determine the specific age of ocean standstills or how fast the sea level in the Victoria region was falling to each of these locations. It appears that the sea level fell from around 27 meters to near the present shore in a period of only about 400 to 600 years. 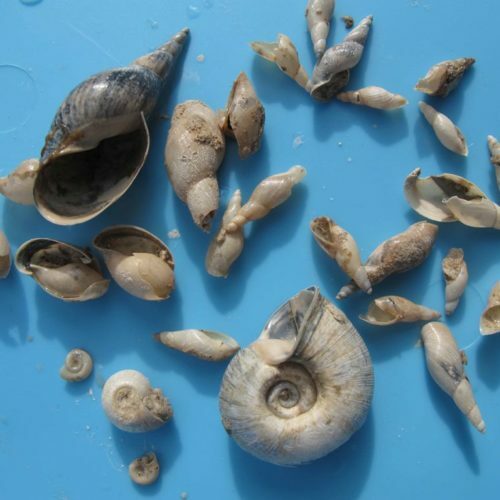 This might suggest the land was rising in relation to the sea about a meter every 20 years, but the ocean standstills indicate there were intervals of reduced movement which allowed for the development of shellfish beaches. Until further detailed radio-carbon dating is undertaken we can assume that the ocean standstill at the 14 meter mark in the Haultain Basin is about 13,886 years old and the likely time range is between 13,720-14,052 years ago. Alley, N. F. and Hicock, S. R., 1986. The stratigraphy, palynology, and climatic significance of pre-middle Wisconsin Pleistocene sediments, southern Vancouver Island. British Columbia. Canadian Journal of Earth Sciences 23(3): 369-382. Anderson, Franz E. 1968. Seaward terminus of the Vashon continental glacier in the Strait of Juan de Fuca. Marine Geology 6(6):419-438. Armstrong J.E., Crandel D.R., Easterbrook D.J., and Noble J.B. 1965. Late-Pleistocene stratigraphy and chronology in southwestern British Columbia and northwestern Washington. Geological Society of America, Bulletin 76(3):321-330. Barnosky C.W. 1981. 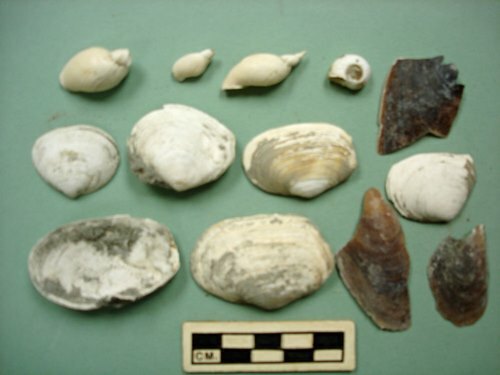 A record of late Quaternary vegetation from Davis Lake, Southern Puget Lowland, Washington. Quaternary Research 16(2):221-239. Barnosky, C.W. 1985a. Late Quaternary Vegetation near Battle Ground Lake, Southern Puget Trough, Washington. Geological Society of America, Bulletin 96(2):263- 271. Barnosky, C.W. 1985b. Late Quaternary vegetation in southwestern Columbia Basin, Washington. Quaternary Research 23(1):109-122. Barnosky, C.W., Anderson, P.M., and Bartlein, P.J. 1987. The northwestern U.S. during deglaciation; vegetation history and paleoclimatic implications. In North America and Adjacent Oceans During the Last Deglaciation. Edited by W.F. Ruggiman and H.E.Wright, Geological Society of America, Boulder, CO, pp. 289-321. Barrie, J.V., and Conway K.W. 2002. Rapid sea level changes and coastal evolution on the Pacific margin of Canada. Sedimentary Geology 150(1-2): 171-183. Blais-Stevens, A., Bornhold B.D., Kemp A.E.S., Dean J.M., and Vaan A.A. 2001. Overview of Late Quaternary Stratigraphy in Saanich Inlet, British Columbia: results of Ocean Drilling Program Leg 169S; Marine Geology 174(1-4): 3-20. Blake, W. Jr. 1982. Geological Survey of Canada radiocarbon dates XXII. Geological Survey of Canada, Paper 82-7. Bretz, J.H. 1920. The Juan de Fuca lobe of the Cordilleran ice sheet. Journal of Geology 28(4):333-339. Clague, J.J. 1976. Quadra Sand and its relation to the late Wisconsin glaciation of southwest British Columbia. Canadian Journal of Earth Sciences 13(6):803–815. Clague, J.J. 1977. Quadra Sand: A study of the late Pleistocene geology and geomorphic history of coastal southwest British Columbia: Geological Survey of Canada, Paper 77-17, 24 p.
Clague, J.J. 1978. Mid-Wisconsinan climates of the Pacific Northwest. In Current Research, part B. Geological Survey of Canada, Paper 78-1B, pp.95-100. Clague, J.J. 1980. Late Quaternary geology and geochronology of British Columbia, Part 1 – radiocarbon dates. Geological Survey of Canada, Paper 80–13, pp. 28. Clague, J.J. 1981. Late Quaternary geology and geochronology of British Columbia, Part 2: Summary and discussion of radiocarbon-dated Quaternary history. Geological Survey of Canada, Paper 80-35, 41 p.
Clague, J.J. 1983. Glacio-isostatic effects of the Cordilleran ice sheet, British Columbia, Canada. In Shorelines and Isostasy. Edited by D.E. Smith and A.G. Dawson. Academic Press, London, UK, pp. 321–343. Clague J.J. 1986. The Quaternary stratigraphic record in British Columbia — evidence for episodic sedimentation and erosion controlled by glaciation. Canadian Journal of Earth Sciences 23(6): 885-894. Clague, J.J. 1989. Cordilleran Ice Sheet. In Quaternary geology of Canada and Greenland. Geological Survey of Canada, Geology of Canada No. 1. Edited by R.J. Fulton, R.J. pp. 17-95. Clague J.J., Armstrong J.E., and Mathewes W.H. 1980. Advance of the late Wisconsin Cordilleran ice sheet in southern British Columbia since 22,000 yr BP. Quaternary Research 13(3): 322-326. Clague, J.J., Harper, J.R., Hebda, R.J., and Howes, D.E. 1982. Late Quaternary sea levels and crustal movements, coastal British Columbia. Canadian Journal of Earth Sciences 19(3):597–618. Clague, J.J., Mathewes, R.W., Guilbault, J.P., Hutchinson, I. and Ricketts, B.D. 1997. Pre-Younger Dryas resurgence of the southwestern margin of the Cordilleran ice sheet, British Columbia, Canada. Boreas 26(3):261-278. Clague, J.J., and James, T.S. 2002. History and isostatic effects of the last ice sheet in southern British Columbia: Quaternary Science Reviews 21(1-3):71–87. Clague J.J., Ager T.A., and Mathewes R.W. 2004. Environments of northwestern North America before the last glacial maximum. In Entering America: Northeast Asia and Beringia before the last glacial maximum. Edited by D.B. Madsen. University of Utah Press, Salt Lake City, UT. pp. 63–94. Cosma, T.N., Hendy, I.L., and Chang, A.S. 2008. Chronological constraints on Cordilleran Ice Sheet glaciomarine sedimentation from core MD02-2496 off Vancouver Island (western Canada). Quaternary Science Reviews 27(9-10):941– 955. Deo, Jennie N., John O. Stone and Julie K. Stein. 2004. Building Confidence in Shell: Variations in the Marine Radiocarbon Reservoir Correction for the Northwest Coast over the past 3,000 Years. American Antiquity, 68(4)771-786. Dethier, D.P., Pessl Jr. F., Keuler, R.F., Balzarini, M.A., and Pevear, D.R. 1995 Late Wisconsinan glaciomarine deposition and isostatic rebound, northern Puget Lowland, Washington. Geological Society of America, Bulletin 107(11):1288–1303. Dyck, W. and Fyles, J.G. 1962. Geological Survey of Canada radiocarbon dates I. Radiocarbon 4:13-26. Dyck, W. and Fyles, J.G. 1963. Geological Survey of Canada Radiocarbon Dates I and II: Geological Survey of Canada, Paper 63-21. Dyck, W., Fyles, J.G., and Blake, W. 1965. Geological Survey of Canada Radiocarbon Dates IV; Geological Survey of Canada, Paper 65-4. Dyck, W., Lowdon, J.A. Fyles, J.Q. Blake, W. Jr. 1966. Geological Survey of Canada Radiocarbon Dates V. Geological Survey of Canada, Paper 66-48. Fulton. R. J. 1971. Radiocarbon geochronology of southern British Columbia. Geological Survey of Canada, Paper 7 l-37. Fyles, J. G. 1958. Stratigraphy of the Cordova Bay Pleistocene deposits. Geological Survey of Canada, unpublished diagram. Halstead, E.C. 1968. The Cowichan Ice tongue, Vancouver Island. Canadian Journal of Earth Sciences 5(6): 1409-1415. Hansen, B., and Easterbrook, D. J. 1974. Stratigraphy and palynology of late Quaternary sediments in the Puget Lowland, Washington: Geological Society of America, Bulletin 85(4):587-602. Heusser, C.J. 1973b. Environmental sequence following the Fraser advance of the Juan de Fuca lobe, Washington. Quaternary Research 3(2):284-306. Hicock, S.R., and Armstrong, J.E. 1985. Vashon Drift: definition of the formation in the Georgia Depression, southwest British Columbia. Canadian Journal of Earth Sciences 22(5):748-757. Hutchinson, I., James, T.S., Reimer, P.J., Bornhold, B.D. and Clague, J.J. 2004. Marine and limnic radiocarbon reservoir corrections for studies of late-and postglacial environments in Georgia Basin and Puget Lowland British Columbia, Canada and Washington, USA. Quaternary Research, 61:193-203. Huntley, D.H., Bobrowsky P.T., and Clague J.J. 2001. Ocean Drilling Program Leg 169S: surficial geology, stratigraphy and geomorphology of the Saanich Inlet area, southeastern Vancouver Island, British Columbia. Marine Geology 174(1-4): 27- 41. James, Thomas S., John J. Clague, Kelin Wang, Ian Hutchinson. 2000. Postglacial rebound at the Northern Cascadia subduction zone. Quaternary Science Reviews 19:1527-1541. James, Thomas S. Evan J. Gowan, Ikuko Wada and Kelin Wang. Viscosity of the asthenosphere from glacial isostatic adjustment and subduction dynamics at the northern Cascadia subduction zone, British Columbia, Canada. 2009. Journal of Geophysical Research, 114, B04405. Keddie, G. 1979. The Late Ice Age of Southern Vancouver Island. 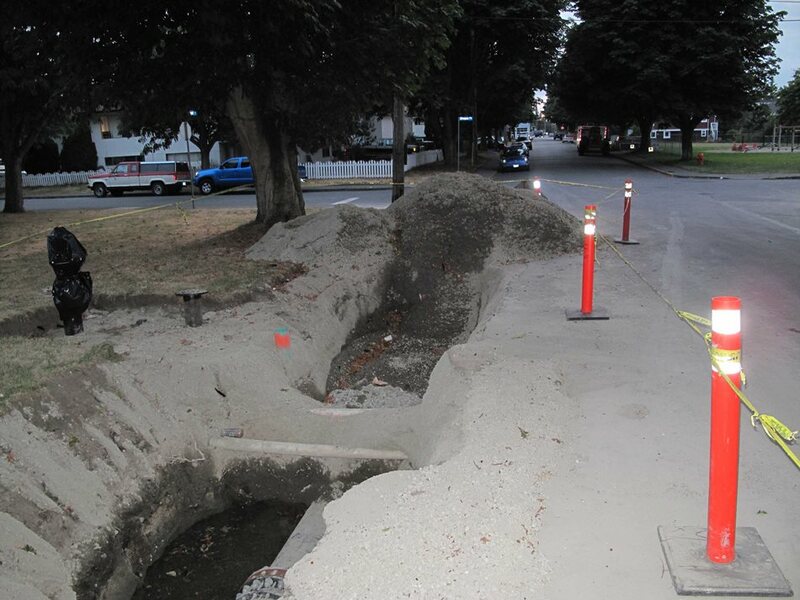 The Midden (newsletter of the Archaeological Society of British Columbia) 11(4)16-22. Linden, R.H. and P.J.Schurer. 1988. Sediment characteristics and sea-level history of Royal Roads Anchorage, Victoria, British Columbia. Canadian Journal of Earth Sciences 25:1800-1810. Lowdon, J.A., Fyles, J.G., and Blake, W., Jr. 1967. Geological Survey of Canada radiocarbon dates VI. Radiocarbon 9:156-197. Lowdon, J.A., Robertson, I.M. and Blake, W. Jr. 1977. Geological Survey of Canada radiocarbon dates XVII. Geological Survey of Canada, Paper 77-7, 25 p.
Lowdon, J. A., and Blake, W., Jr. 1978. Geological Survey of Canada radiocarbon dates XVIII. Geological Survey of Canada, Paper. 78-7. Mackie, Q., D. Fedje, D. McLaren, N. Smith, and I. McKechnie. 2011. Early environments and archaeology of coastal British Columbia. Chapter 3 in N.F. Bicho, J.A. Haws, and L.G. Davis (eds.) Trekking the Shore: Changing Coastlines and the Antiquity of Coastal Settlements, pp. 51-103. Springer-Verlag, New York. Mathews, W.H. 1979. Late Quaternary environmental history affecting human habitation of the Pacific Northwest. Canadian Journal of Archaeology 3:145-156. Mathews, W.H., Fyles, J.G., and Nasmith, H.W. 1970. Postglacial crustal movements in southwestern British Columbia and adjacent Washington State. Canadian Journal of Earth Sciences 7(2)690–702. Miskelly, Kristen Rhea. 2012. Vegetation and climate history of the Fraser Glaciation on southeastern Vancouver Island, British Columbia, Canada. Master of Science Thesis, Department of Biology. University of Victoria. Mosher, D.C., and Hewitt, A.T. 2004. Late Quaternary deglaciation and sea-level history of eastern Juan de Fuca Strait: Cascadia: Quaternary International 121(1)23–39. Mosher, D.C. and Johnson, S.Y. 2001. Neotectonic mapping in the eastern Strait of Juan de Fuca: Report of field activities. Geological Survey of Canada Open File No. 3868. 27 p.
Mullineaux, D.R., Waldron, H.H., and Rubin, M. 1965. Stratigraphy and chronology of late interglacial and early Vashon glacial time in the Seattle area, Washington. United States Geological Survey, Bulletin 1194-0. 10p. Porter, S.C., and Swanson, T.W. 1998. Radiocarbon age constraints on rates of advance and retreat of the Puget lobe of the Cordilleran Ice Sheet during the last glaciation. Quaternary Research 50(3): 205-213. Robinson, S.W. and G. Thompson. 1981. Radiocarbon corrections for marine shell dates with application to southern Pacific Northwest Coast prehistory. Syesis 14:45-57. Shugar, Dan H., Ian J. Walker, Olav B. Lian, Jordon B.R. Eamer, Christina Neudorf, Duncan McLaren, Daryl Fedje. 2014. Quaterary Science Reviews 97. Stuiver, M., and Reimer, P.J. 1993. Extended 14C database and revised CALIB radiocarbon calibration program. Radiocarbon 35:215–230. Thorson, R.M. 1980. Ice-sheet glaciation of the Puget lowland, Washington, during the Vashon Stade (Late Pleistocene). Quaternary Research 13(3): 303–321. Thorson, R.M. 1980. Ice-sheet glaciation of the Puget lowland, Washington,during the Vashon Stade (Late Pleistocene). Quaternary Research 13(3):303–321. Thorson, R.M. 1989. Glacio-isostatic response of the Puget Sound area, Washington. Geological Society of America, Bulletin 101(9):1163–1174. Waitt Jr., R.B., and Thorson, R.M. 1983. The Cordilleran ice sheet in Washington, Idaho, and Montana. In Late-Quaternary Environments of the United States, Vol. 1: The Late Pleistocene. Edited by S.C. Porter. University of Minnesota Press, Minneapolis, MN, pp. 53–70. Ward, B.G., Wilson, M.C., Nagorsen, D.W., Nelson D.E., Driver, J.C., and Wigen, B. 2003. Port Eliza cave: North American West Coast interstadial environment and implications for human migrations. Quaternary Science Reviews 22(14):1383–1388.